Peer into these recipes and you’ll see their true highlights: fresh sage and thyme. 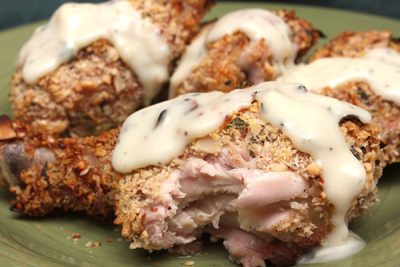 The “Crusted Chicken with Almonds & Sage” and its “White Thyme Gravy,” from the October 2011 issue of Cuisine at Home, produce beautifully crusted, moist chicken with a nice, thick gravy. Their inclusion of the fresh herbs make the music. Preheat oven to 425 degrees F. Coat a wire rack with nonstick spray and set inside a baking sheet. Season all chicken pieces with salt and pepper. Combine almonds, panko, and sage in a dish. Place buttermilk in a separate dish. Dip chicken pieces in buttermilk, roll in almond mixture to coat, and place on prepared rack. Roast chicken until crisp and golden brown, about 50 minutes. Chicken is cooked when an instant-read thermometer registers 175 degrees F. Remove from oven and let rest 5 minutes before serving. Melt butter in a medium saucepan over medium heat. Whisk in flour; cook until roux is a light tan color, about 2 minutes. Whisk in broth mixture until there are no lumps. Stir in thyme, salt, vinegar, and pepper, and cook until the gravy thickens, 3-4 minutes. I was happy to use six chicken thighs and five drumsticks in this recipe. Buttermilk will always help to make your chicken moist -- that and I made sure to roast this chicken for only 39 minutes, until the thighs reached 175 degrees F. The almond-panko-sage crust was definitely a winner. As for the gravy, the broth/milk combo came together easily. The thyme perfume was its highlight. Next time, I plan to go crazy with three recipes, all tied together by a 2009 Argentinian Torrontes wine and some bacon: the “Classic Clams Casino,” from the October/November 2011 issue of Fine Cooking, the “Fricassee of Chanterelles,” from the September 2011 issue of Bön Appetit, and the “Zucchini and Spinach Gratin,” from Simply Recipes.